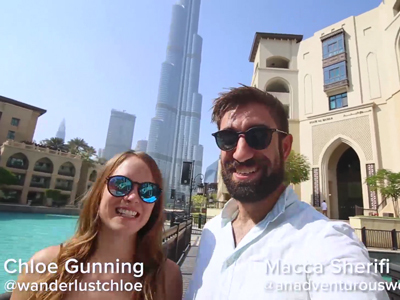 Planning a weekend city break in Dubai? Whether it's a last minute trip or you're counting down the days in your calendar, this dazzling city is sure to impress with world-class sights, sands, souks and shows. You're probably thinking packing this city's must-sees into two days is impossible, but our handy guide of what to do in Dubai in 48 hours has your itinerary covered – serving a mixture of Middle Eastern culture with modern city life. If you do have a little more time to spare - take a look at our top 15 things to do in this dazzling city. You have endless choices on where to stay in Dubai, ranging from luxury suites in the heart of the city to budget hotels by the sand. Browse our list of all-inclusive five-star hotels in Dubai or check out our cheap holidays in Dubai. LANDMARK GRAND HOTEL: At the 4-star Landmark Grand Hotel, opposite Al Ghurair Mall on Riqqa Road, you can pick from two restaurants that serve Arabic and international cuisines. And if you can pull yourself from soaking up the rays on loungers by the outdoor pool, plan a desert safari or a visit to the Dubai Dolphinarium and Aquaventure. HOTEL MOVENPICK BURDUBAI: A marble fountain welcomes you to this modern hotel in Bur Dubai, leading you to a Mediterranean-style atrium. Choose from a variety of cuisines from seven restaurants and bars, and pack in some work as well at the business centre, as the kids get busy. The Dubai Creek and Wafi Mall are less than a 20-minute walk from the hotel, besides other attractions. RAMADA JUMEIRAH HOTEL: The lavish property stands tall, barely a 10-minute walk from the beach, with rooms that offer exclusive living rooms, besides lots to keep you entertained, such as lively bars, a heated rooftop swimming pool, fitness centre and beauty salon. SOFITEL DUBAI JUMEIRAH BEACH: Look forward to 5-star luxury, right on Jumeirah Beach, looking out at the Dubai marina from the comfort of your room or while you sip cocktails by the huge pool. There’s also a spa, fitness centre, besides a host of restaurants and bars, making it the perfect choice for families, couples and solo travellers. HOTEL RADISSON BLU DEIRA CREEK: The four-star hotel puts you right at the centre of all the action, at Deira Creek in Old Dubai, where you can go sightseeing and shopping. If you plan to stay in, there’s never a dull moment, with 13 restaurants, bars and cafes, an outdoor pool, plus a fitness centre, spa and sauna. You can also grab a game of basketball, squash or billiards. HABTOOR GRAND RESORT & SPA JUMEIRAH: Get ready for a glitzy holiday at this 5-star property, right by the Dubai Marina and Mall of the Emirates. Sunbathe on the Jumeirah Beach or go snorkelling and diving in the waters. To top it all, there are 16 themed restaurants and bars, gardens and lounges, fitness centre and spa, plus heated pools for kids and adults. Dubai is a foodie paradise! You can dine on gourmet cuisine at elite restaurants or savour local delicacies at cheap diners and shawarma joints in the old section of Bur Dubai. Sample Michelin-starred fare at Hilton Dubai Creek and Grosvenor House Hotel, or if you're looking for a more traditional meal, hit the pavement eateries on Al Dhiyafah Road to feast on Iranian, Indian and Lebanese fare. Check out the popular Ravi restaurant for some delicious curry, Sidra for sumptuous salads and grills, or indulge in authentic Arabian cuisine on a dhow cruise instead. In the morning, combine some time at the beach with breakfast at one of the many cafés that line Jumeirah Walk. If you plan well, you can see most of what Dubai has to offer in 48 hours. Start with the luxurious Burj Al Arab hotel, which stands on its exclusive island and dominates the Dubai skyline. It’s also conveniently located next to the resort of Madinat Jumeirah. Take in the main sights downtown, including the Dubai Mall, where you’ll find the aquarium and near which stands the world’s tallest building, the Burj Khalifa. You can also explore souks in the older part of town, by sailing across the Dubai creek and still have enough time to kick back leisurely on the sands! Take a look at our all-inclusive holidays in Dubai, so you can soak up the best of the city without worrying about what you're spending! Too crunched for time to plan your dream itinerary? 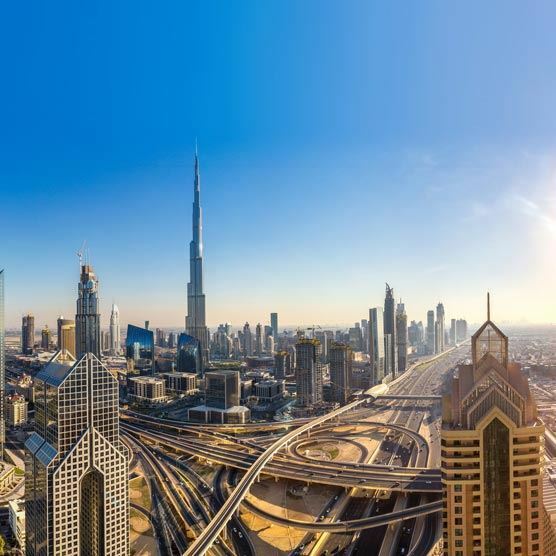 Book a hop on-hop off double-decker tour that takes you through the top sights of Dubai, without having to worry about planning routes or staying on top of schedules. Take some time out to admire the Burj Khalifa and explore the Dubai Mall. If you're clueless about where to stay or which flight to take, check out our last minute holiday deals in Dubai that lets you plan the perfect city break in Dubai without blowing your budget! For a tour of Dubai’s hidden eateries, check out the foodie tour offered by Frying Pan Food Adventures. You can even take an aerial ride over Dubai in a helicopter, to celebrate a special occasion or simply for the heady experience! Soak up the rays on the soft, white sands of Jumeirah Beach, which offers a private stretch of sand as well as a park that’s open to the public, where you can sunbathe or indulge in a barbeque. Stroll on the sands, looking out at the Persian Gulf, or sip coffee at a café and relax with a book. You can also get in the waters for a swim or jog on the tracks. Make sure you’re done with most, if not all, of your sightseeing, so you can spend some leisurely hours topping up your suntan on the beach. The Dubai Aquarium & Underwater Zoo located on the ground level of the Dubai Mall makes for a great day out with the family, where you can get up-close with thousands of marine animals, including 300 sharks. Look forward to glass-bottomed boat rides, snorkelling in cages and getting up close to penguins, piranhas, otters, sea jellies and more. The Underwater Zoo is also home to the King Croc, which weighs over 750kg - now that's impressive! The tallest building in the world, Burj Khalifa, is a destination in itself thanks to its 200 + storeys hosting an observation deck at level 124, a cloud-scraping swimming pool on the 76th floor, all navigable by an elevator that travels at 10 metres per second. It also houses fine dining restaurants, retail stores and a sumptuous spa (of course). But before you enter, it's worth spending a few minutes marvelling at the Dubai Fountain below, near its entrance, a magnificent spectacle of sound and light. Make sure you click a picture of the 360-degree panorama once you reach the top, too! You can plan in advance and purchase tickets for an At The Top tour, which usually lasts one-and-a-half hours. That's right, you can officially experience snow in the middle of desert - well, at the ice rink at Dubai Mall. Let the kids dance on ice at this fabulous skating arena, which plays lively music in the evenings. The Olympic-sized rink also hosts a snack bar and provides ice hockey sticks and T-shirts, which you can pick up as a souvenir. Don't fancy pulling on your skates? Dubai has a whole host of family-friendly attractions that are worth exploring if you've got the kids in tow. Head out early in the morning for a few thrill-seeking hours spent discovering the golden desert sands, where you can go dune-bashing, quad-biking, sand boarding and ride camels. For a more spectacular view of the sands, hop on a hot air balloon ride and float elegently across the dunes – the experience is unforgettable! Bursting with mega malls, designer boutiques and traditional souks, Dubai is one of the best places in the world to indulge in retail therapy. Browse the spectacular Dubai Mall and The Mall of the Emirates, where you can fill up your shopping bags with goods from local boutiques and famous brands like Harvey Nichols. If you have time, take a ferry or traditional abra across the Dubai Creek to Bur Dubai, where you’ll discover the Heritage and Diving Village of Al Shindagha. Once here, you can pick up Bedouin handicrafts or handmade jewellery, and even get clicked with a falcon!